I recently attended a conference that asked attendees to follow the “rule of two feet”. Throughout the conference day, if you found yourself in a session that didn’t apply or interest you, it was fine to pick up and move to another session. The presenter would not be offended, but would realize that the session was not a good match for that particular person. The probing question that came up throughout the day was “If students could utilize the ‘rule of two feet’, would they choose to stay in our classroom, or move on?” A powerful question to ponder. In my district, we teach all students the acronym S.L.A.N.T. from the book Teach Like a Champion. S.L.A.N.T. stands for Sitting up, Listening, Asking & Answering, Nodding, and Tracking the speaker. We say this acronym, if needed, as a reminder of learning behaviors students should be executing during direct instruction. Typically, students sit up straighter in their chairs and make eye contact with the teacher when they hear the acronym. It helps my students “tune in” to explicit instruction for a mini-lesson, for they know something new is coming. Many of my students come to school without proper learning behaviors, and this is a way to help them know how they should look when information is being shared with them. Is S.L.A.N.T.-ing engagement? Definitely not. Does it help students to learn? Yes, I believe it does. Compliance is not a bad thing. There are times when I must have everyone comply with my directions or it could make for an unsafe learning environment. Compliance is certainly an easier task for some students than others, and when we think about managing our classroom, lack of compliance is the reason why we give most consequences. While it is important to teach our students compliance, if we’re relying on that alone for student achievement, especially with our unorthodox learners, we fail. In a classroom that relies on compliance only, students would execute the rule of two feet and walk right out of the door. 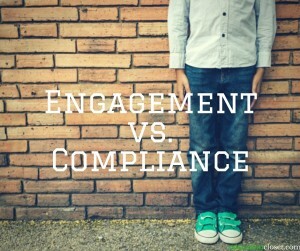 How do we increase student engagement? When students are engaged, they are so immersed in their learning that they aren’t thinking about anything else. In other words, their brain is fully engaged in the topic or task. This can happen with teacher directed instruction. It definitely happens with students centered activities. The surefire way to increase student engagement is for students to take ownership of their learning. This can happen with Genius Hours, Innovation Days, and through personalized learning. For those of us with specific curriculum and standards to master, arts-integrated, project-, problem- or inquiry-based classroom engagement strategies are the way to go. Not only do these projects “hook” our learners, but they keep students engaged by providing a genuine reason to be learning. They also provide an authentic audience that helps students hold themselves accountable for excellent work. If you aren’t familiar with Project Based Learning, please explore the great resources and classroom engagement strategies Education Closet has to offer! So, if you were a student in your classroom, would you stay? If not, reflect upon what aspect(s) of the day you wouldn’t like and explore how you could change it. Not only would that exploration help to increase student engagement and achievement, it could also cut down on your behavior problems. A win-win!